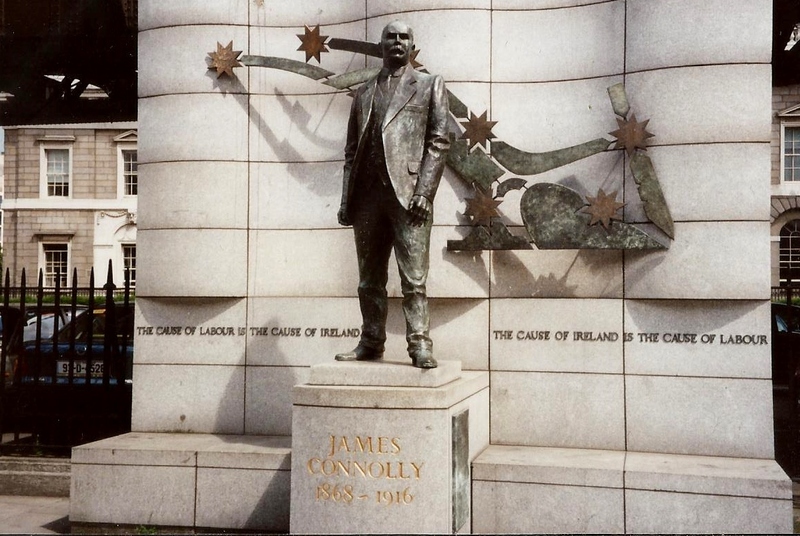 The Irish socialist James Connolly, executed by the British for his part in leading the 1916 Easter Rising, is revered as a patriot, but he was never a chauvinist. Among the lesser-known episodes of Connolly's life is the time he stood for election in Dublin in 1902, and made a bid for the immigrant vote with a leaflet in Yiddish. 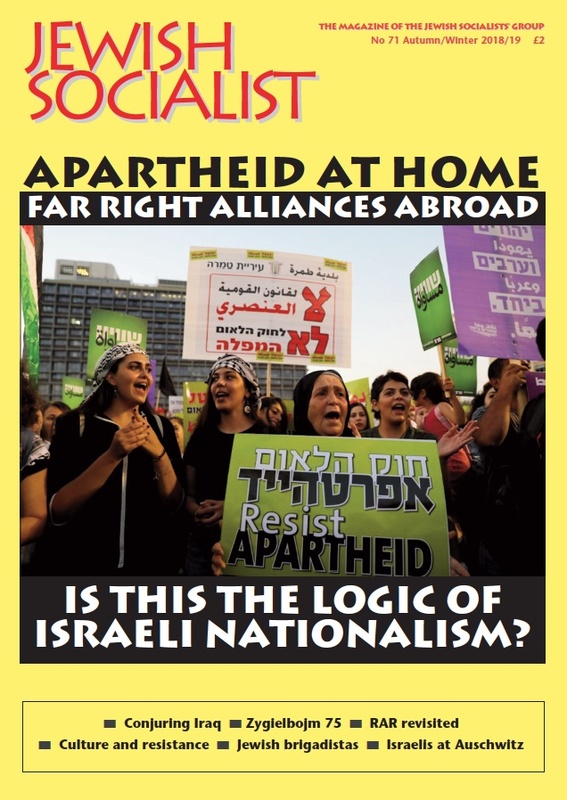 The leaflet itself is an example of international collaboration, as it was written by Boris Kahan, Secretary of the East London Jewish branch of the Social Democratic Federation. 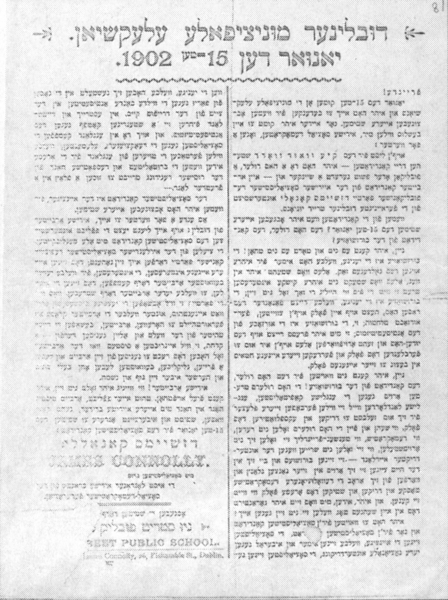 This translation was provided for the Irish journal Saothar by Sid Resnick, of the US Yiddish socialist newspaper, Morgen Freiheit. On 15th January, the Municipal elections will take place and you are asked to consider for whom to cast your vote. But, before your reach your decision we, Jewish Social Democrats, wish to say a few words. There are three candidates on the list for the Wood Quay Ward: you have here a Home Ruler, another a publican, and one labour candidate of the Irish Socialist Republican Party, James Connolly, who is supported by the Dublin United Labourers Union. For which of the candidates will you vote on 15th January? For the Home Ruler, the candidate of the bourgeoise? No, you cannot and you ought not do that! It is the bourgeoise which always has the bag of gold before its eyes. Everything that stands in its way, everything that does not agree with its gut interests it tramples underfoot no matter how sacred that may be. It is the bourgeoise that arouses race hatered, incites one people against another and casuses war. The bourgeoisie is the cause of Anti – Semitism; with its press it provokes hatered of the Jew and seeks to throw the blame for everything upon the Jew in order to deceive the people and conceal its sins against its own people. No, you cannot vote for the Home Ruler, the candidate of the bourgeoisie! The Home Rulers speak out against the English capitalists and the English landlords because they want to seize their places so that they themselves can oppress and exploit the people. No mater how nicely and well the Home Rulers talk or how much as friends of man they seek to appear or how much they shout about oppressed Ireland – they are capitalists. In their own homes they can show their true colours and cast off their revolutionary democratic disguise and torment and choke the poor as much as they can. And you, Jews, what assurance do you have that one fine day they will not turn on you? You ought to vote for the Socialist candidate and only for the Socialist candidate. The Socialists are the only ones who stand always and everywhere against every national oppression. It is the socialists who went out onto the streets of Paris against the wild band of anti-Semites at the time of the Dreyfus case. In Austria and Germany they conduct a steady struggle against anti – Semitism. And in England , too, the Socialists fight against the reactionary elements who want to shut the doors of England against the poorer jews who were driven to seek a refuge in strange land by the Russian government’s brutality and despotism. The Socialist candidate is the only one for whom you ought to cast your vote. In conclusion, a few words to you, Jewish workers of Dublin. Upon you rests the obligation to support the Socialist candidates as much as you can. The aims of the Irish Socialist Republican Party ought to be close to you. These are your own interests, the interests for which every knowledgeable worker must fight. These are the objectives for which every worker must strive. What does this party want? It wishes to abolish that system of private ownership under which the working class is condemned to labour, to create the wealth of the world and enjoy for itself absolutely nothing It wishes to construct a system in which the worker shall have the right to benefit from his labour and live a free, happy and enlightened life without bosses and rulers over his body and soul. Jewish workers! No matter how small your numbers as you can achieve much. Do your duty and work earnestly had in hand with your Irish brothers. Canvass for votes, vote yourself and persuade others to vote on the 15th of January for the Socialist candidate, James Connolly. With acknowledgements to the Dublin life blog 'Come Here To Me'.